Please take time to read these wonderful rhyming picture books! Congratulations to the all the authors and illustrators! Best in Rhyme Top 20 List! Watch for Top 10 Best in Rhyme Award books of 2017 announced mid-November. The final 2017 Best in Rhyme Award announcement will be on February 3, 2018 in New York City at the KidLitTV Studio. The Best in Rhyme committee is a group of dedicated Rhyme Revolution members. They have been busy reading, reviewing and scoring the nominated rhyming picture books for 2017. Members of the Rhyme Revolution Group nominated books for consideration. 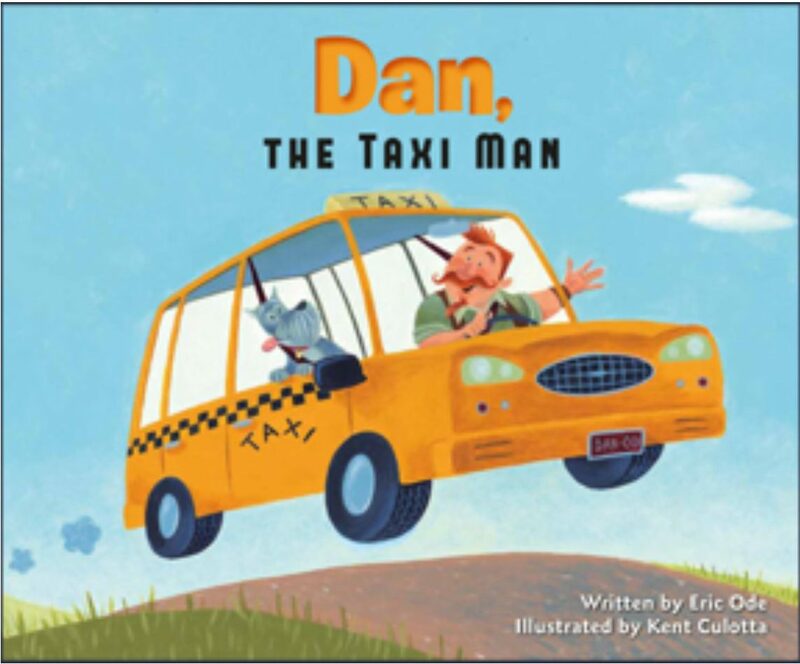 *Due to the fact that Angie Karcher has a rhyming picture book nominated for this award, she has not been involved in the reading or scoring of any of the nominated books this year. The committee has been in charge of making the final decisions concerning the winner(s) of this award. and opportunities are just beginning! If you participated in Rhyme Revolution 2017 copy and paste this badge and share it proudly on your website and on social media! Please add #rhymerevolution to your post. Congratulations on completing another year of learning and rhyming fun! First bit of exciting news!! I have been busy contacting a few agents and editors this month and have more submission opportunities for writers of rhyme! Starting June 1st, my manuscript critiques will receive a star rating (from 1 – 5 stars) based on the quality. An author who receives a 5 star rating on a rhyming picture book manuscript will be invited to submit to a growing list of agents and editors interested in reading manuscripts with the Rhyme Revolution stars. You can purchase a manuscript critique HERE. *As I am receiving quite a lot of manuscript critique requests, I will only accept a limited number per month and then put you on a waiting list or bump you to the next month, so I can respond in a timely manner. As stated above, the rating system begins June first but you may purchase a critique now and it will qualify for this opportunity. This is SO exciting and will hopefully improve the reception and quality of rhyming manuscripts. Interested agents and editors may contact me at Angie.karcher@yahoo.com. Now that Rhyme Revolution is over, are you ready to focus on writing a rhyming picture book manuscript? Registration is now open for The Rhyme Revolution Online Writing Classes. The classes run June – November and fill up fast as I only accept 5-7 people per class. I’m offering less classes this year as I have several projects going on so, don’t delay if you want a spot! I always bring in an accomplished author who writes rhyming picture books to do a Q and A the last week of class. We do a weekly webinar on Google Hangout and you will receive daily lessons via a private Facebook group for the class. You can look at the lessons at your convenience so it works well for those with busy schedules. I offer a private face-to-face critique to each class member that will include the starred rating system opportunity. The classes often continue as a rhyming critique group after the month ends. It is a fun, low key class yet packed full of tons of info and links to keep you reading for weeks if you follow up. Here is more information and the class registration info. Sign up for a rhyming critique group! The deadline to comment is May 5th. First, you must join the Rhyme Revolution Facebook Group. The post is pinned at the top of the feed. Comment there and you will be registered for a rhyming critique group! Make sure we are friends on Facebook (If not, send me a friend request) and I will add you to a private Facebook critique group. Once you are in the group you will see the guidelines and organize yourselves. Each group will need an organizer (so comment as well if you will volunteer to get things started) to keep everything organized. This position can rotate as you decide. Once this group is set, you are on your own to keep it going. We have had many successful rhyming critique groups and I am happy to facilitate these again this year! Pay in full or make bi-monthly payments. An amazing faculty at this 4 day Rhyme Revolution Conference! Editor – TBA very soon! Everything has been mailed out. for these generous book donations!! I’m Asia, the publisher behind The Innovation Press, and I love rhyming books. As a parent, I love how engaging rhyming books are for children (hidden bonus: I don’t get tired of reading them 9023840384 times). As an educator, I know how valuable they are to the development of language and reading skills. Which is why, as a publisher, I actively seek rhyming submissions. This year we have ten titles coming out and three of them are written in rhyme. So far we have two more rhyming books slated for 2018…and there’s space for more. All that to say, I am definitely excited to meet all of you! I was thrilled to discover Angie’s event to teach the craft of rhyming. Because it definitely is a craft! 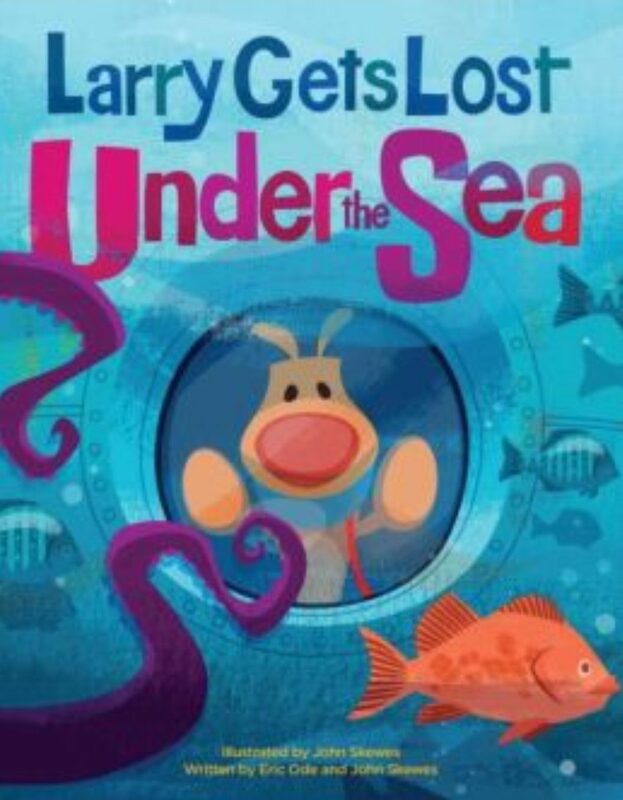 Writing a children’s book is hard enough without the additional layer of making sure the rhyme and meter work perfectly without losing any of the content or character development in your story. In terms of what I’m looking for in a submission — I love manuscripts that tell a creative and/or quirky story. I am always really excited to see books that have an original approach that I haven’t seen before. As a former teacher, I also value manuscripts that have some sort of learning involved (whether it be character learning or academic learning). If you take a peek at our 2017 books, you’ll see I have a bit of a penchant for hybrid texts — books that combine non-fiction and fiction. Oh and I also love manuscripts that make kids laugh. Though we are a newer press, we have international distribution and foreign rights representation. Our books are found in stores, shops, libraries, and schools all over the world and in several different languages. 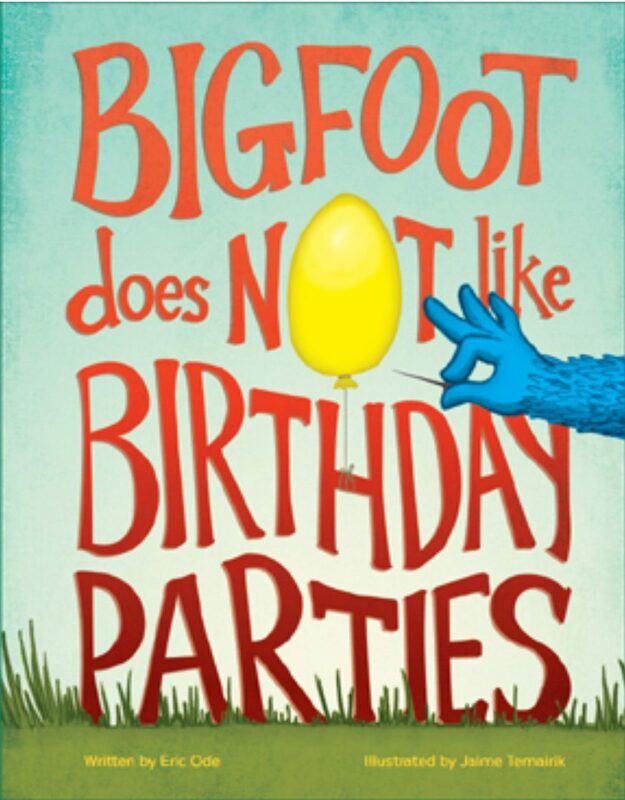 We are also a member of the Children’s Book Council and we are an SCBWI PAL Publisher. If you think you have something that would be a great fit for us, we’d love to see it! You can find our submission guidelines on our website here. And last, but definitely not least, I’m giving away two of our 2017 rhyming picture books. 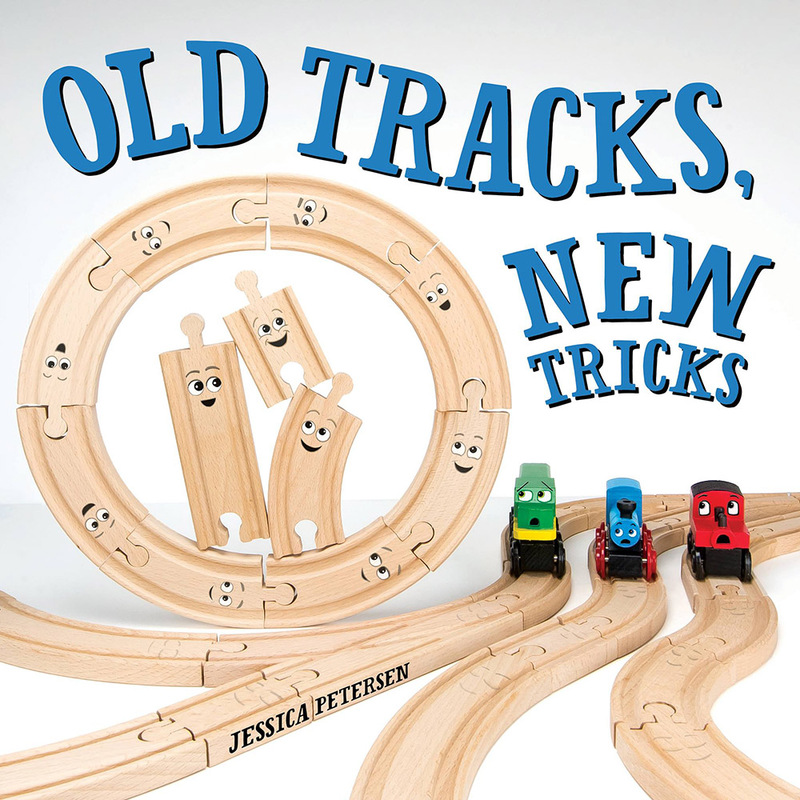 OLD TRACKS, NEW TRICKS came out last month and is both written and illustrated by debut author (and SCBWI member) Jessica Petersen. 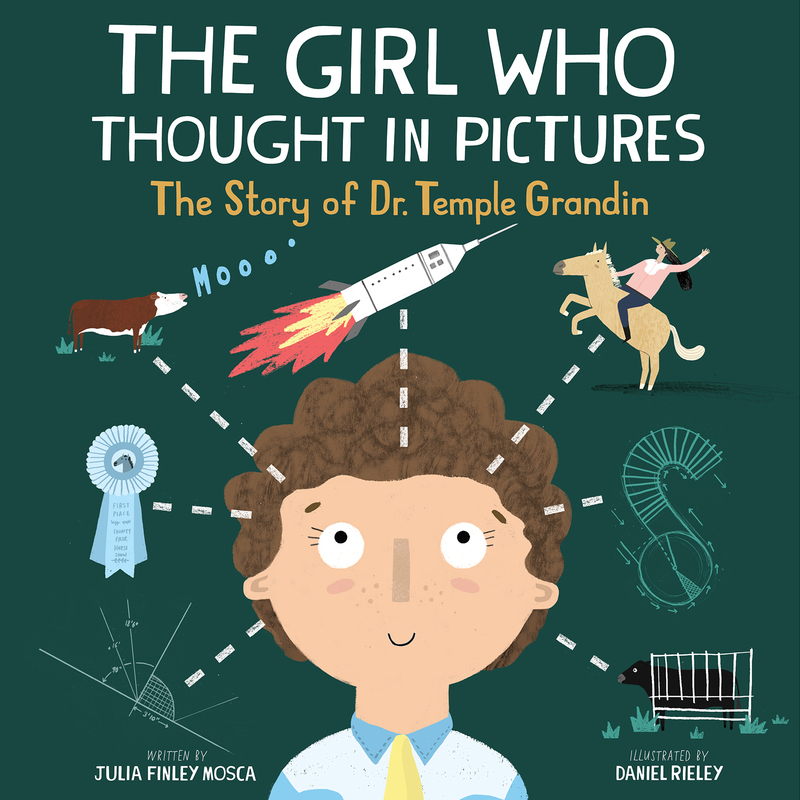 THE GIRL WHO THOUGHT IN PICTURES is the first book in our new rhyming biography series, Amazing Scientists, that highlights the lives and achievements of amazing women scientists. Thanks for so much for having me and HOORAY FOR RHYMING BOOKS! “What do you mean you’re going to start a publishing company? That’s what I heard when I announced to my friends and family that I was going into the publishing business. Let’s face it—self-published books are often held to a higher standard than those from traditional publishers. The market is flooded with indie books, many of which, I’m sad to say, are of inferior quality. Now, add to the equation the desire to write and publish a rhyming children’s book and the plot thickens (pun intended). Yes! Children love rhyming books and are often able to memorize a rhyming story after hearing it just a few times. They also love to guess the last word of a rhyming line. Often, when reading to a class of kindergarten children, I will read a line from my book, such as “When evening comes and you turn off the light, it’s time to climb into bed for the ______.” I pause and let them fill in the word “night.” They are always very proud of themselves. Remember: The basic story creation is the same whether you are writing in prose or in rhyme. After you have your idea, you need to create a character with whom children will identify and a compelling story that has a beginning (the character and situation are introduced), a middle (the storyline progresses) and an end (resolution to the situation). If these elements are missing, the story is incomplete. That is why I always write my story in prose first, then create the rhyme. 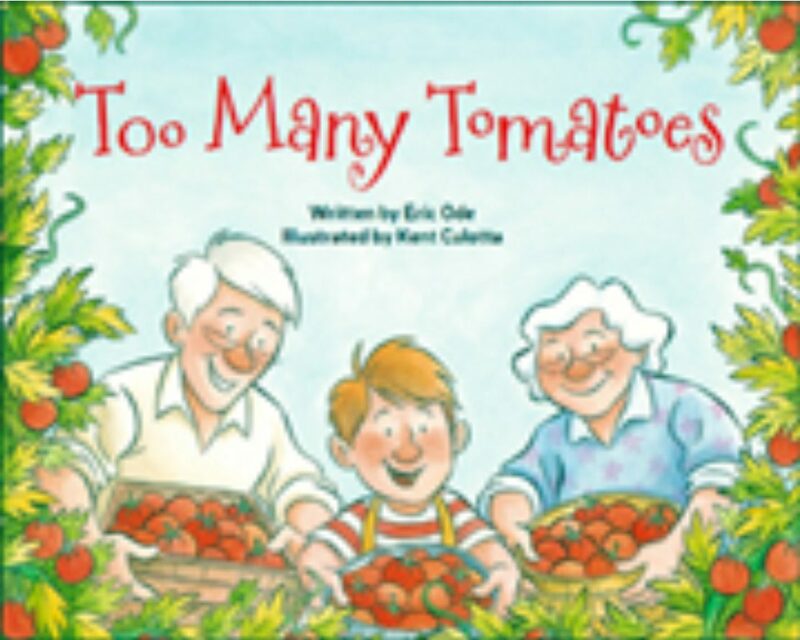 If a rhyming book has lovely rhyming text, but no story, children won’t “get it.” However, on the other hand, if the story is wonderful, but the rhyming is “off,” that is just as bad. Poor rhymes can be as annoying as fingernails on a chalkboard. The words must really rhyme; you can’t force it. If words don’t rhyme, they don’t rhyme! Then, there’s the rhythm. The rhythm pattern should be consistent throughout the book. A rhyme without rhythm doesn’t work. Sometimes simply adding or deleting one or two extra syllables can make a huge difference, but you really have to be able to feel it. If you are having difficulty with your own rhyming and rhythm, remember my advice: A story written in good prose is much better than one written in poor rhyme. Do your homework first. Read lots of rhyming books. See what children are reading. Then think like a child, but write like an adult. This was the Best in Rhyme Award Winner for 2015! and then…learn how to make your own dragon game! Make your own dragon game! Right click, copy, paste and print the template above. 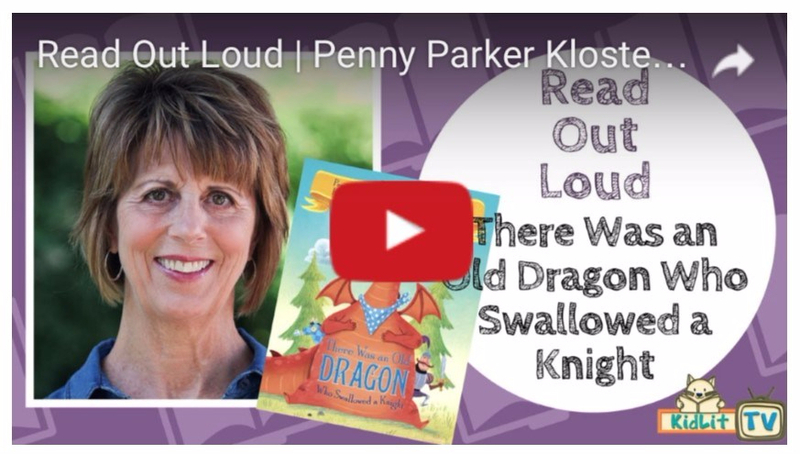 HERE are more ideas for dragon fun on Penny’s website. Want to purchase this adorable book? KidLit Crafts with Ms. Angie! I’m so excited to work with Julie Gribble and the KidLit TV team! Rhyme Revolution 2017 Day 17 ~ Diana Murray ~ Revise Like a Pirate! So you’ve finished your rhyming picture book manuscript. The words seemed to pour out onto the page straight from your heart. Ah, what a magnificent draft. How you admire it. Tis’ a thing of beauty. Now…stop being a lilly-livered landlubber and get yer cutlass ready! Time to revise like a pirate! My editor thought that sounded bumpy. When I read it myself, I put a lot of stress on “one”, so it sounded OK to me. But a few crit partners mentioned the issue as well and I didn’t want any pesky barnacles slowing down the story. So I simply changed it to: “The pirates were a rugged lot—as fierce as they were strong./And as they swabbed the deck one day, they sang this pirate song:” It was a small tweak, but it established the rhythm more clearly, keeping things moving along regardless of individual pronunciation. One reason I think it works in this case is that the first line has a feminine ending. That is, it has an unstressed syllable at the end (“QUI/et”). So omitting an unstressed syllable before “Yarrrh” doesn’t feel jarring. On a side note, these lines are also “headless”. That is, I omitted the first unstressed syllable at the start of the line, so that the rhythm is, ba/DUM ba/ba/DUM ba/ba/DUM. When I began writing many years ago, I always wondered why I was driven to eliminate the first unstressed syllable in anapestic meter. After some research, I discovered that it’s commonly done because it better mimics natural spoken language. Rhyme scheme: Pick a rhyme scheme and stick with it. But never let the rhymes commandeer your story! Story always comes first. You don’t want your rhymes to sound twisted or unnatural or to scream “mutiny”. Also, be aware of using only obvious rhymes. It’s fine to rhyme house with mouse and bee with tree, but including some surprising rhymes (or simply multi-syllabic rhymes) can add interest and punch to the story. Repetition and Refrain: It’s sometimes useful in a story to have an event/action happening over and over again. In NED THE KNITTING PIRATE, Ned keeps trying to change the words to the pirates’ sea shanty and is met with disapproval from the Captain each time–thus building tension. You can also consider using a refrain, a repeated phrase that children can join in on, thus enhancing potential for a fun read aloud. And just like rhythm, the refrain can have a bit of variation to keep things from getting boring. In my story the pirates keep singing a song but the lyrics change slightly. Rest: Sometimes the best thing you can do is take a break from your manuscript. Why not throw down anchor for a while? Write something else, take a walk, drink some grog. I wrote a first draft of NED in 2010. I liked the concept, but the story didn’t feel quite right. There wasn’t enough conflict and the ending wasn’t satisfying. I couldn’t make it work. After some initial crits and attempts to revise, I finally set it aside. I didn’t look at that manuscript again for close to two years! With fresh eyes, suddenly everything was clear to me. It was almost like reading a manuscript that wasn’t my own. I started relentlessly revising without hesitation, making filler words, story tangents, and so-called “darlings” walk the plank! I hope this helps you revise like a pirate. Oh, and don’t forget to give your story a nice, strong hook! Yarrrrrrh! I’m going to start with a confession: I never actually set out to write in rhyme. The first stories I wrote were in prose. But when the idea for The Snatchabook came to me – and it came pretty much fully formed – the story itself seemed to dictate that it should be written in verse. I knew that I had to create an atmosphere of suspense and mystery, and to draw the reader in from the very beginning of the story. Writing in rhyme seemed an effective and natural way to achieve this. This opening 4-line stanza is written in monorhyme (the last word in each line rhyming with all the other last words) for a specific purpose; to foreshadow the events of the story and to link the two main characters, Eliza and the Snatchabook (who will, of course, eventually become friends). The first and fourth lines introduce an element of suspense, suggesting to the reader that something scary is about to happen. The middle two lines, in contrast, present an image of cosy domesticity; however, the fact that they are enclosed by the first and fourth lines warns us that Eliza’s bedtime routine is about to be disrupted. Monorhyme should, in general, be used sparingly (to avoid becoming tedious), but it can be an effective device in the right place. A bedtime book was being read. Princesses, trying to sleep on peas. “Stop stealing all our books, right now! To give back all the books he’d picked. Eliza Brown was very strict. Incidentally, in the original (UK) version, I’d used ‘nicked’ – a colloquial British term for stolen – rather than ‘picked.’ Some words get (literally) lost in translation! Leo liked to sit and read. They’d like to have a chat. But he couldn’t just do that! Abracazebra? I smell a rat. You can’t trust an animal with stripes like that! “Abracazebra? I smell a rat. You can run out of time. You can run out money. When things don’t seem funny. By breaking with the original rhyme scheme and introducing a refrain, the central message of the story is reinforced, and the key word (love) is given its own, un-rhymed status. When reading the story aloud to elementary school children, I’ve found that they naturally join in, saying the word ‘love’ at the end of each refrain; and I think that the rhyme scheme encourages them to do this. Finding the right rhyme scheme for each story can be tricky, but it’s also fun and ultimately satisfying, as is finding the right words to rhyme. Good luck if you are writing your own rhyming story! Before becoming an author, Helen used to teach Spanish and French. She also has an MA in Film and Television Production. Helen has lived and worked in France, Spain, Cuba and Mexico, and now lives in Swansea, Wales, with her husband, the author and illustrator Thomas Docherty, and their two daughters. Her first rhyming story, The Snatchabook (illustrated by Thomas Docherty), has been translated into 17 languages. In 2014 it won an award voted for by school children. It has also been staged as a play and even as an opera, by a school in Canada. The Storybook Knight (2016) is Helen and Thomas’s latest book together. Helen’s next rhyming story, You Can Never Run Out of Love (illustrated by Ali Pye), is coming out in September 2017. I will stick these in the mail next week. I have your addresses via registration. Leonard’s Beard, was destined to be written in rhyme. On the day the seed for the story was planted in my mind, the wind was blowing hard. It was a beautiful, sunny, Fall afternoon and my husband had just come home from work. He entered through the door in my studio. The wind caught the door and slammed it against the wall. A powerful gust of wind entered the room blowing my notebooks and folders to the floor. My two dogs scrambled to get to them before I could. One of the folders that contained photos I had taken of my neighbor Leonard in his writing studio, spilled out under trampling dog feet. As I distracted the dogs and gathered the pictures up from the floor, my husband asked if I’d gotten to rake any leaves in the yard. I guiltily answered no, as I continued sorting the photos and placing them back into a folder titled “Leonard.” Glancing once again at the photos, I started to smile and my mind began racing. I thought about the leaves I hadn’t raked and mentioned to my husband with a laugh, that I didn’t have to rake. The leaves would all find their way to the bottom of the hill and into Leonard’s yard anyway. At that moment, the thought expanded. I imagined if Leonard was standing outside in his yard, that whatever would blow downhill just might land in his beard. Since my eccentric neighbor wore a large red beard, everything might get caught and trapped in that beard. I literally felt the rhythm of the day bouncing in my head as the first line of the story was etched in my mind. “Below a great hill, in a house by a bog, lived a writer named Leonard, his dogs, and a frog.” It was the rhythm of the day, and in that moment, I didn’t choose a writing style as much as the rhyme chose itself. There was no question that this stormy story sang a song. The story of a writer who loses his direction, then finds it due to a wind storm, blew into my imagination and was set free on the wings of rhyme. Leonard’s Beard, is essentially about living in the moment and not losing sight of what’s important to you. Through joyful language and pictures it reminds us that it doesn’t have to take a wind storm to be yourself, but sometimes it helps! I’ve written eight picture books and three of them were written in rhyme. I believe that instinctually you know through the characters, subject matter and intent of the story, what style of writing will compliment that story. Like a symphony, music is intended to convey a mood, and I believe writing style does the same. If you allow yourself to be free of overanalyzing and controlling, the expression will come naturally. That is the magic. Nancy Cote, an award winning Children’s Book Author / Illustrator, has illustrated over forty picture books and has written eight of her own. Her stories, illustrations, paintings and poems have been featured in many exhibits, collections and children’s magazines throughout the U.S. She is currently earning International recognition for three picture books she illustrated for Ariella Books of Berlin, Germany. She was featured at the University of Southern California Book Festival having illustrated the first three books of the ReadConmigo award winning series of bi-lingual books and is a full member of the Society of Children’s Book Writers and Illustrators. Currently she is being represented by the Liza Royce Agency in NYC. Nancy earned a B.F.A. in Painting at U. Mass, Dartmouth and worked part-time in the children’s department of the Swansea Library for sixteen years, until she ventured out as a freelance author/illustrator with the encouragement of her husband Mike, and her family. She works full-time from her home studio in the historic village of Somerset, MA.